"This wasn’t caused by a natural disaster. This is a man-made crisis," National Education Association President Lily Eskelsen García said. Frustrated educators were asking politicians to do the math on Monday as thousands of teachers swarmed the Oklahoma and Kentucky state capitals to demand an increase in their wages and in school funding. Every public school in Kentucky and many schools in Oklahoma closed on Monday due to the large number of teachers protesting. The simultaneous protests across the country marked a breaking point for many teachers, who say they're tired of raising money and paying out of pocket for their underfunded classrooms. In Oklahoma, one teacher held a sign that simply read "5,655" — the amount of money she'd raised over the last two years for basic supplies for her students. Another teacher's sign read, "My class size 40-45." And several had the same words on their sign: "609,463 reasons to fund education" — a reference to the number of public school students in Oklahoma. The demand for lawmakers to approve more education funding comes just days after the state Legislature approved educators' first pay raise in 10 years. While many said the recent approval of a raise for teachers was a step in the right direction, several educators at the Oklahoma rally said more overall funding for their schools was their top priority. Jason Simeroth, the superintendent of schools in Yukon, Oklahoma, told MSNBC that in his district alone it would cost $1 million to replace all of the outdated math textbooks. "I think one of the things when people see this, they say, 'The teachers got a raise.' They did. It's the first one in long time, but they’re not just here for that," Simeroth said. "They’re here for resources, here for desks. ... We haven’t had an operational increase since I’ve been doing this, and I’ve been doing this 27, 28 years." Simeroth said backing the teachers in his district is part of the "family-style culture" in Yukon. "It is a heartfelt thing. It’s not just something to do, a way to get attention," he said. "This is the heart of education ... This is what it’s all about. It’s about people pulling together for the betterment of our kids, which is going to help Oklahoma in the long run." Heather Caram, another teacher at the protest, told MSNBC that she would soon be leaving Oklahoma to accept a job in Georgia. Her sign read, "Oklahoma's #1 export is teachers." "We have too many uncertified teachers teaching in Oklahoma and I have two daughters," Caram said. "We’re looking at the front end of a serious teaching crisis and I want better for them. That means leaving the state, unfortunately." National Education Association President Lily Eskelsen García, who attended the Oklahoma rally, said educators who are tired of 20-year-old textbooks held together by duct tape had gathered to say "enough is enough." "This wasn’t caused by a natural disaster. This is a man-made crisis," she said. Oklahoma teachers, among the lowest paid in the nation, according to the National Education Association, have followed the tactic of teachers in West Virginia. West Virginia's nine-day strike resulted in a 5 percent raise for teachers. Kentucky teachers continued to protest on Monday, leading to the shuttering of all public schools in the state. 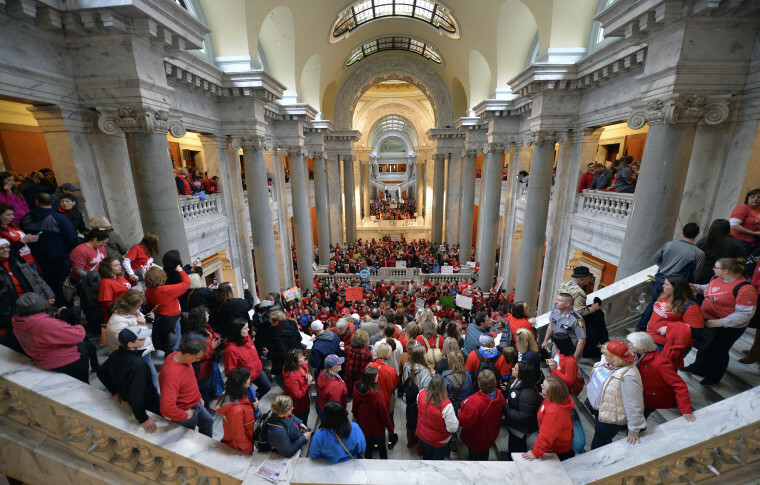 The Kentucky Education Association began Monday's rally at union headquarters in Frankfort. It was followed by a march to the Capitol. A small group of teachers and school employees had already gathered early Monday outside the Capitol Annex, where lawmakers have their offices. A large sign displayed outside the Annex said, "We've Had Enough." Outside the Capitol, a sign said, "You Make Us Sick." Teachers have rallied several times during this year's legislative session to protest a pension bill. But Monday's event was shaping up as their biggest event as lawmakers try to reach agreement on a new budget. Teachers in Arizona are also considering a strike over their demands for a 20 percent salary increase. The wave of red-state teacher walkouts stems partially from the fact that they don't have strong collective bargaining laws, according to Agustina Paglayan, an incoming assistant professor of political science and public policy at the University of California, San Diego, and a postdoctoral fellow at the Center for Global Development. In an analysis for The Washington Post published Monday, Paglayan explained that teachers in states with stronger collective bargaining laws — typically more liberal and wealthy states — have more to lose by striking. She notes that these laws aren't necessarily the cause of an increase in funding, but bluer states that have them typically spend more on education anyway. Collective bargaining laws first really gained popularity in the U.S. in the 1960s, when public sector strikes were a problem, Paglayan said. However, these bargaining rights came at a price. In 19 of 33 states that have introduced collective bargaining rights, they also heavily penalize teachers and unions that went on strike — with loss of pay, fines and suspension of existing bargaining agreements, among other penalties. The remaining states either didn't require bargaining laws or prohibited it. In 2011, Republicans in 11 states, including Oklahoma, cut back teachers' collective bargaining rights. "Since the 1960s, mandatory collective bargaining laws have not only helped maintain peace in public-sector labor relations — they also haven’t caused governments to spend more on teachers and schools," Paglayan wrote. "Ironically, conservative lawmakers who cut back these laws could inadvertently cause even more public-sector strikes." Last week, Oklahoma Gov. Mary Fallin signed legislation that would raise teachers' pay for the first time in a decade. The legislation increases taxes on cigarettes, fuel and oil and gas production to provide teachers with raises of about $6,100, or 15 to 18 percent. The new revenue measures are expected to generate about $450 million, with the bulk going to teacher raises and about $50 million going to general education funding. But many educators say it's not enough. The teachers are asking for a $10,000 raise over three years, and additional classroom funding of $75 million. The teachers hope that the funding will be put toward replacing outdated textbooks, broken chairs and desks; reinstating foreign language and arts classes; and ending four-day school weeks. Oklahoma ranks 47th in the nation in public school revenue per student, nearly $3,000 below the national average, while its average teacher salary of $45,276 ranks 49th, according to the most recent statistics from the National Education Association. "A lot of teachers are just tired of the promises," said Alberto Morejon, a junior high history teacher from Stillwater, Oklahoma, who launched a teacher walkout page on Facebook that quickly reached more than 70,000 followers. Alicia Priest, president of the Oklahoma Education Association teachers union, said Monday's rally could lead to a longer walkout as teachers from across the state press their demands that lawmakers approve more funding for state classrooms. "It's day-by-day, depending upon the Legislature fulfilling their promise," Priest said. "We're going to say that our Legislature started the process and they have a moral obligation to invest in our children and our children's future. That obligation has not been met yet. Funding for our students is an issue in every schoolhouse in the state of Oklahoma." The teachers union has also criticized House and Senate leaders for passing a measure repealing a $5-per-night hotel and motel tax that was part of the original education package. Repeal of the hotel tax reduces the total package by about $45 million. "It's just one more broken promise that our educators have seen over the last 10 years," Priest said. Although many public schools had shuttered on Monday, some in Oklahoma were offering free meals to students aged 18 or younger while various churches, faith organizations and charitable agencies are providing free day-care services.